Stuck at home with no car, dreary yet hot afternoon outside... bleh. Dashiell is running around in his Spider-man costume. Annaliese wants to join in the superhero fun, so she heads to her room to put on her jazz dance costume (which was pretty expensive and I'm glad she enjoys playing in it). I looked at her and realized, "HEY! 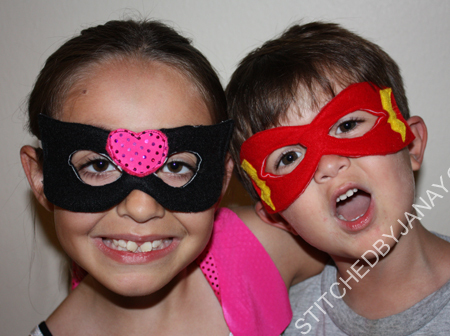 I can make her a mask so she really looks like a superhero!" He chose lightning bolts, so of course I did red and yellow like the Flash. Annaliese chose the heart, and I cut a bit of the sequin fabric off her hair sash so it really would match her outfit. 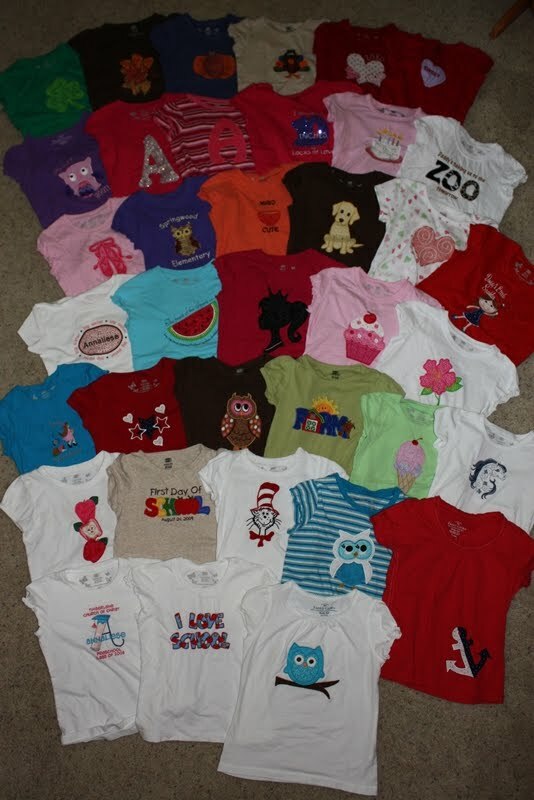 Well, that time of year has come again... to go through my daughter's dresser and purge clothing that is too small. This is always a painful process for both of us -- it's hard to part with such fun and special mommy-made or grandma-made clothing. But we did it tear-free this week! 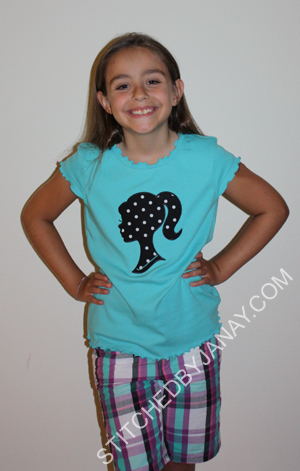 To ease the pain I showed her some blank shirts I had in my stash that we need to use, and told her I could easily replace the silhouette applique shirt she was sad to part with, because *I* had a design I wanted to use!! 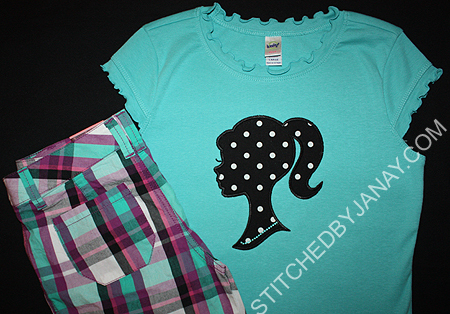 Don't you love how perfectly this teal colored shirt matches her plaid shorts! What a fun surprise for us to discover. The black in the shorts made this shirt the perfect canvas for the Silhouette Girl from 8 Claws and a Paw (which I fell in love with right away and am finally putting to use). Annaliese picked the polka dots. I was aiming for a marbly black, but it is *her* shirt... so I said yes. UGH. Every blog post that ends with a picture of one of my children makes me sigh and wonder, "how can she be this big???" 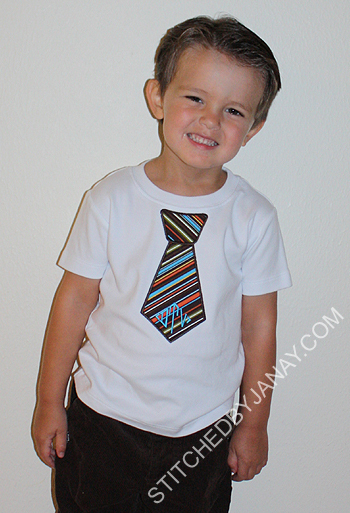 Though you'd never believe it from the picture I posted last Easter, Dashiell loves his tie shirt. He wears it to church at least once a month, if not every other week. You'd think everyone has seen it by now, but it always gets a chuckle out of somebody new. :) Anyway, a few weeks ago Dashiell found himself with a dry erase marker in his hand... and the shirt has been retired. Last Sunday when I reminded him of this fact he asked, "Mom, can you make me a NEW tie shirt? With a dark brown tie? On a white shirt?" I said ABSOLUTELY! 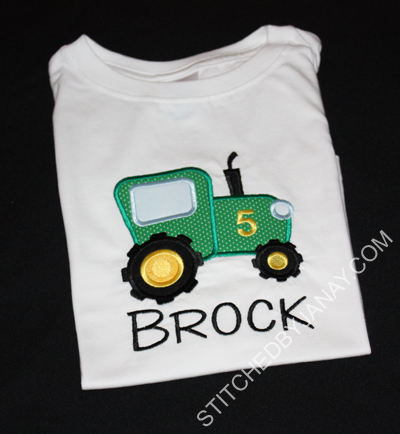 I will make applique shirts for my little man as long as he will wear them! Woo-hoo!! 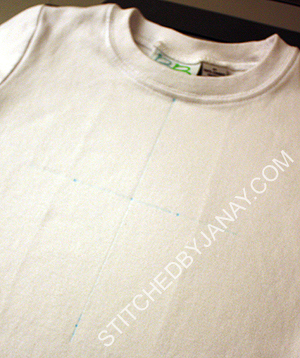 Check out the design placement along the ribbing of the neckline! Then I connect the dots to find where the center of my design should fall. Now I am able to hoop my shirt, confident the tie will end up exactly where I want it -- just under the ribbing of the neckline. 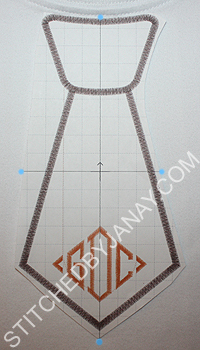 I also use the design template to help me prep my applique fabric. 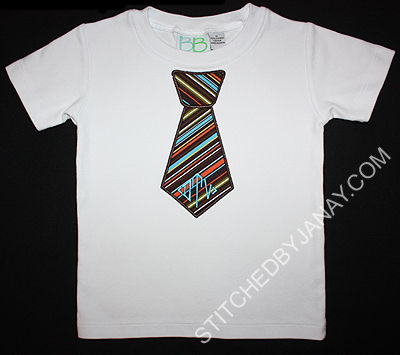 I love using stripes for this design, placed at an angle. 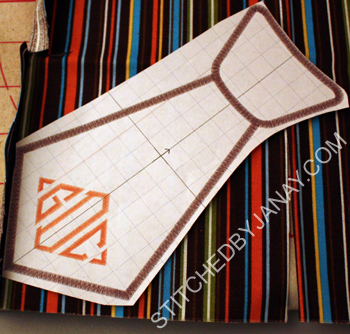 I lay my template on top of the fabric and cut a rectangle around the bottom portion of the tie. The extra fabric leftover in one of the corners of my rectangle is the perfect size for the knot of the tie, turned at a 90 degree angle! I add heat-n-bond lite to the fabric and head to my machine. "Can I wear my new tie shirt? I'd be so handsome!" Why, yes you can. And yes you are. Hollie requested a zebra onesie to give as a gift. 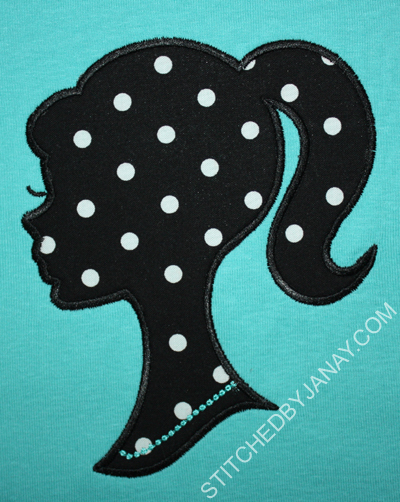 I looked high and low for the exact applique design she wanted, and finally found it at a new-to-me site, Two Crazy Girls Appliques. I used zebra fabric per Hollie's request (to match some baby leg warmers she has, cute!) and added Lillian's name with Swirley from 8 Claws and a Paw. I finally did it! I made an applique name dress for my daughter!! I've been putting this off for a long time since her name has NINE letters. I wanted to do it early in the spring on this Monag dress, but Annaliese wasn't interested. Which was fine, I was a touch nervous. 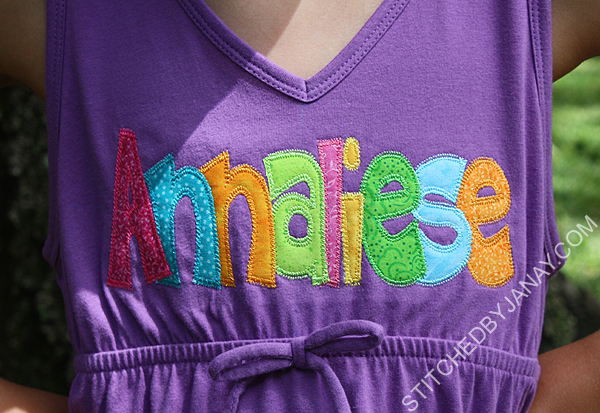 So when she said she wanted an applique name on this sundress from last summer's WM clearance ($5!!) I jumped on the opportunity. 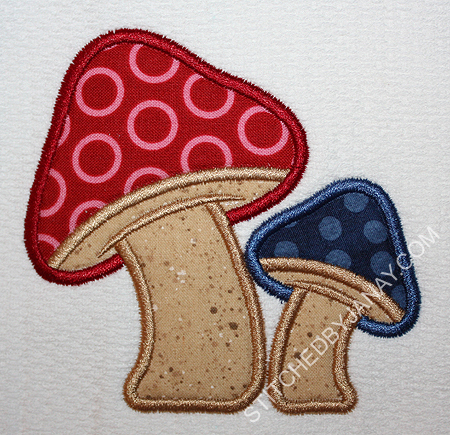 I used Embroidery Boutique's Cade Applique Alphabet (zig zag version) with a lot of design editing. Not that there is anything that needs to be fixed, EB designs are awesome! But I had to significantly squish the letters to get her name to fit in my hoop. I reduced the width to 53% but height stayed 100%. That's why I love zig zag applique fonts, they are pretty forgiving. If you look up close the stitches are closer together on the horizontal parts and spread out on the vertical, but using a matching thread it's really not noticeable. In addition to resizing the letters, I overlapped them as well. I decided to remove the overlapped stitches within my software. I didn't change the placement and tackdown stitches, that's too much work. :) Just deleted the zig zags. 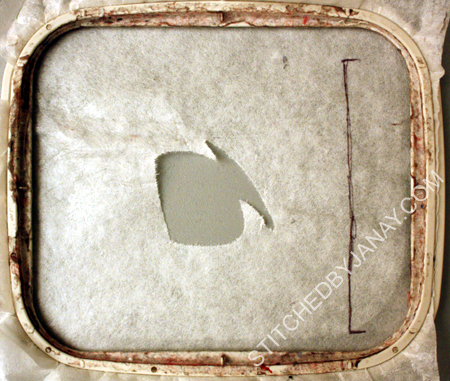 To accomplish this, I watched it stitch out in sew simulator. When it got to the part where the stitches started to go under the previous letter, I hit pause, then split. Continue running sew simulator and just before the point where the letters no longer overlap, split again. Then I deleted the little section I had cut out. Thankfully about halfway through I remembered that in Embird if you hide colors from view, it skips them while in sew simulator mode. That made the process a lot faster by the time I got to the last overlaps I was trying to delete! In the end I'm not sure it was worth the effort since it's a zigzag design, but it definitely would be for satin stitches. It didn't take too horribly long, and since it's my daughter's name, it's quite possible I'll use the design again. ...But then again, you know my love for fonts and variety. Ha! 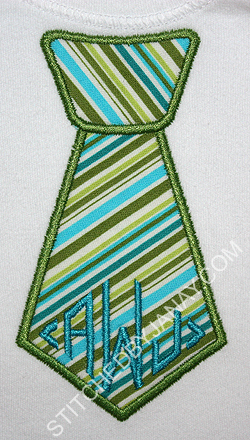 Since they are zig zag letters I knew the tackdown stitch would show, so I wanted matching threads on each one. To save myself from tons and tons of thread changes, I did each letter in it's entirety before moving on to the next, starting with the "e" and working back to the "A". Machine said it had a 17 minute stitch time (woo hoo zig zag stitches!!) but I clocked it, it took me 42 minutes. 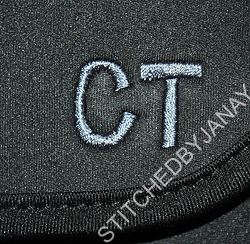 :) Not only is it nine letters cut around, but four of them had little holes I had to trim away as well! WHEW! 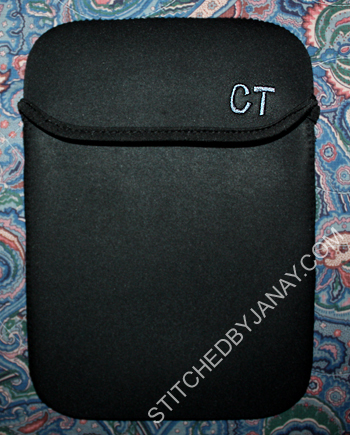 You have NO idea how thrilled I was to be done and let out a sigh of relief that it was on there straight and centered! Time to stock up on designs from my faves! 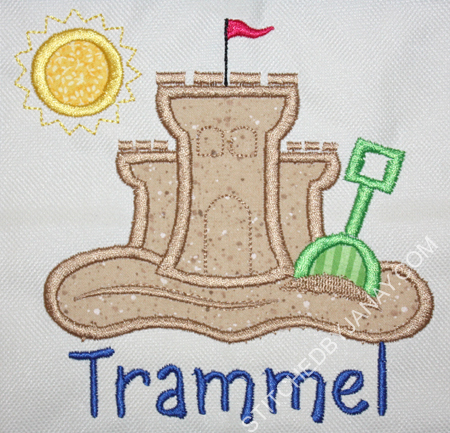 For those of you who do custom embroidery, the next 3-4 days is a fantastic time to stock up on designs from my two favorite sites, 8 Claws and a Paw Embroidery AND Lynnie Pinnie Embroidery! Remember the 8CP Alphabet Membership? (I blogged about it here in the fall.) Well they have brought it back for one month only. You have until 7/20/12 to purchase it! Over 600 fonts and frames for $29.95. Best deal ever. using 8CP's Mandi. I used the darkest charcoal thread so it's very subtle in person... just hard to photograph. Lynnie Pinnie switched to a new server, and is putting it to the test by a big sale -- all single designs are 50 cents through 7/21/12! 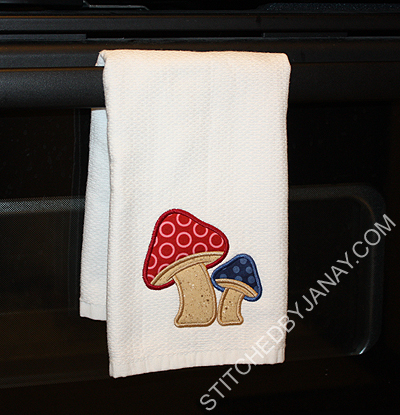 I also put this cute mushroom design on a kitchen towel for myself. I love these fabrics -- they match my kitchen perfectly! 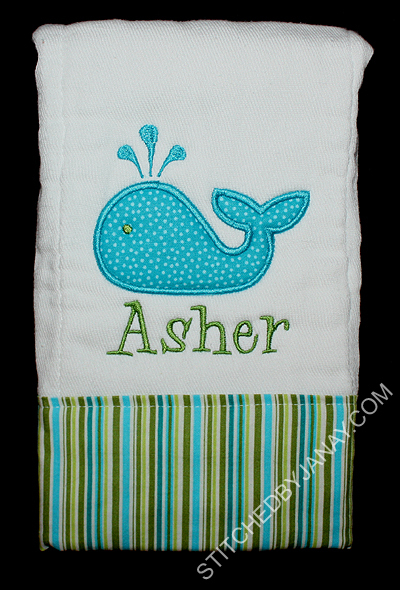 I picked Lynnie Pinnie's Simple Whale and my favorite font, Whoa Nelly from 8 Claws and a Paw. 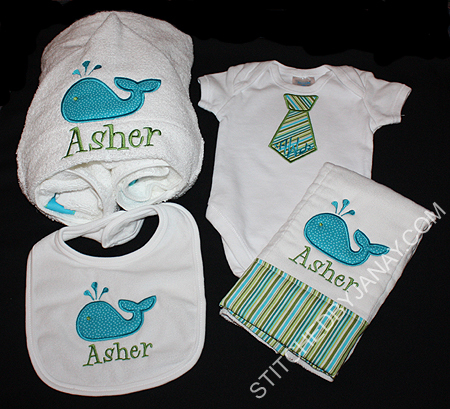 I used the small sizes for the bib and burp cloth and larger sizes for the hooded towel. Jenny also wanted a tie onesie. 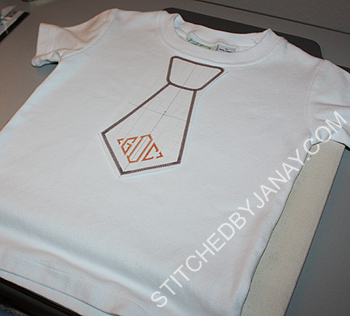 I LOVE making tie onesies, they just might be my all time favorite things! This design is from GG Designs. 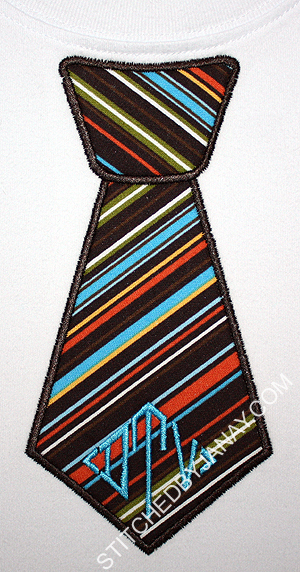 And I love this Riley Blake stripe fabric for the tie, so it was the color inspiration for the whole set! But it got me thinking... there sure are a lot of phrases you find on children's clothing that really aren't things I would choose to embroider. Thankfully in the last five years I have not been asked to do something I am uncomfortable with. I'm sure the day will come, but I do plan to stand my ground and decline. I personally do not like phrases like "Drama Queen" or "Here Comes Trouble". While they may be true ;) they aren't behaviors I want my children to exhibit, so why would I glamorize them? How about "Future Diva" or "Lock up your daughters"? Do you really intend to raise a self-absorbed girl focused on her appearance? A son who is disrespectful to women? For twins, instead of "Double Trouble", how about "Double Blessing"? Oh, don't you know that my face instantly got red!! I thought my heart was going to pound right out of my chest. I won't even launch into all the myriad of reasons why that is horrible. But sometimes it's very subtle. 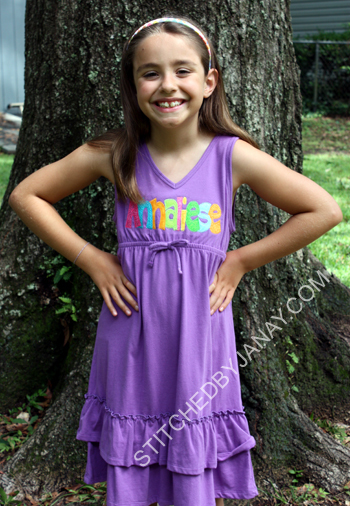 For example, last summer as Annaliese and I were selecting a design for her back to school shirt, we found one in which we both liked the frame, but I wanted to swap out the text for something else. I wasn't thrilled with "homework" being crossed out and a big check mark next to "recess" & "lunch". I explained to her that she is a good respectful girl, that teachers assign homework for a reason. Even if she doesn't like it, she should be respectful towards her teacher's choices. A shirt with homework crossed out looks like complaining or rebellion. I was expecting an "Oh, mom...." rolling of the eyes type of response, but she surprised me. Instead she said, "Oh, I would be a seed of discontent." 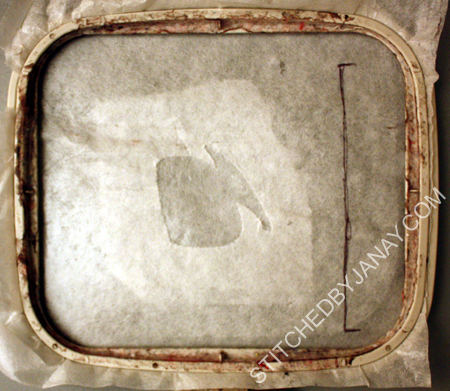 ... so, not your typical Stitched by Janay blog post, huh? There's not even a photograph! Just some of the thoughts that have been rumbling around in my head. Please know that my intention is not to judge the choices others make in dressing their children, but to simply offer my point of view. To challenge you to think carefully about what we glamorize and promote. To my friends, please continue making custom requests, just don't be offended if I say no for personal reasons. I want my projects to be encouraging, not degrading. To honor God. 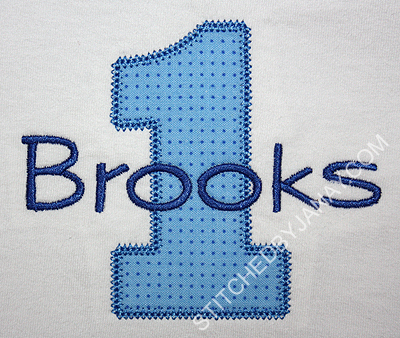 My daughter is going to be so excited tomorrow morning to discover that I have embroidered something for my husband! She recently has expressed concern that I never make anything for him. I tried to explain that he's really not all that into applique ;) and she just doesn't get it. In fact I think she went from being sad for daddy that mommy never makes him anything to disappointed in daddy for not wanting anything mommy makes. Ha! 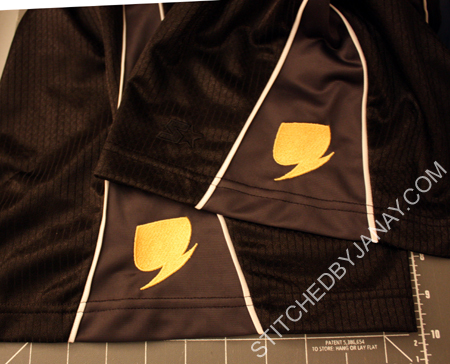 BUT last week he bought some new sports shorts, and asked if I could embroider his own Stormspeed logo on it. 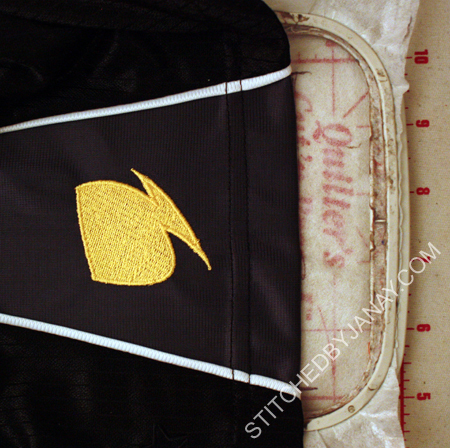 The shorts have stripes on each side, so the emblem was going to be placed within that panel. As I hooped the first leg on sticky stabilizer, I had folded a vertical line so I could center it horizontally, but just eyeballed it vertically, checking (with the trace feature on my machine) to be sure the bottom of the design wouldn't go below the hem, but otherwise was pretty close to the bottom. The placement was great! But as it stitched I realized I had not measured how far up the center of the design was from the hem, and had no idea how I was going to replicate this on the other side. And then it hit me, I had used sticky stabilizer!! and could totally use this to my advantage. you do not judge the condition of my hoop. It is sticky, and I like it that way. So there. And stitched away! And look how perfectly placed both designs are. YAY! 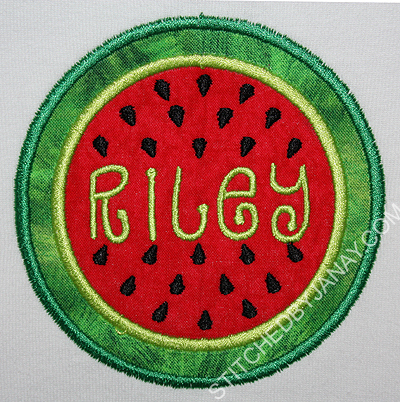 This is the watermelon circle frame from Lynnie Pinnie. 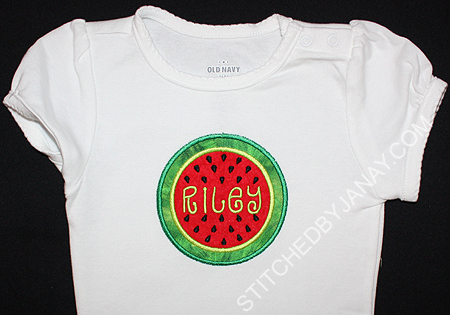 I added Riley's name with the Butterball font from 8 Claws and a Paw. I like using this font since the height of each letter is the same -- it helps make a name with both tall and dangling letters fit in a small space. 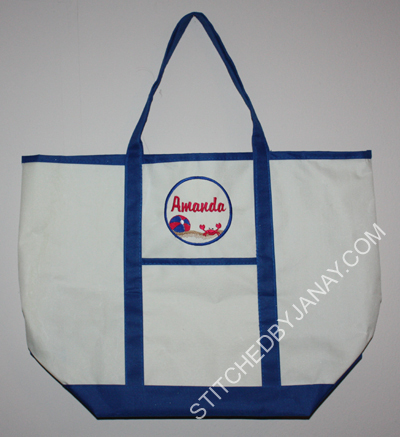 Michelle also asked me to monogram these Thirty-one totes, requesting Curlz from 8CP. 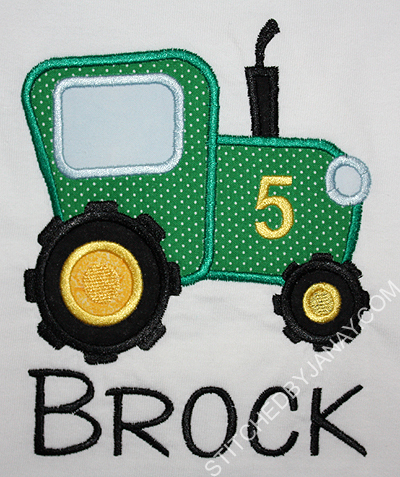 I used Lynnie Pinnie's Tractor Applique design, coloring it as best I could to look like a John Deere. I did lots of fabric trimming on this. Since I selected a pale blue for the window and headlight, I trimmed out the green pin dot before tacking down the pale fabric, and did the same for the yellow center inside the black tire. That step really helps light colors pop! Since I don't have Font Engine for Embird I didn't track down a ttf to match the John Deere logo, I just selected a nice 8CP sans serif font -- Alex. I used all capital letters, enlarging the B to emulate how John Deere looks. I used Embird Alphabet #2 to add the "5"
The "1" is from GG Designs' Chubby Wubby Numbers and I added his name with Alex from 8 Claws and a Paw. 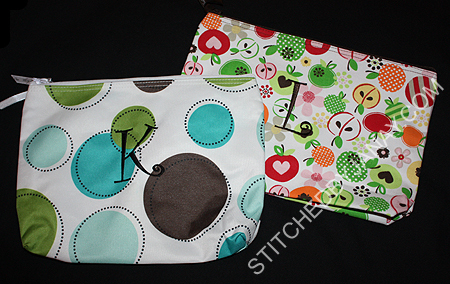 Recently I used a few more totes, making them bags for the pool or beach! 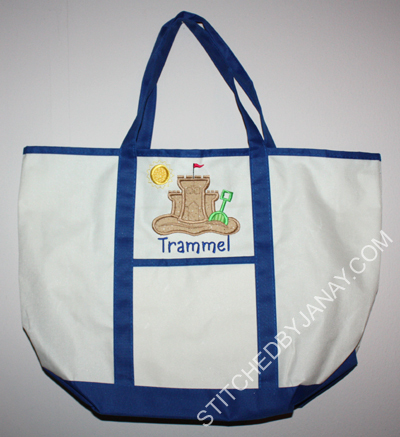 My favorite color is blue, so when I had the opportunity to test this Sand Castle design from Lynnie Pinnie I put it on a blue tote and and added our last name with Coffee Break from 8 Claws and a Paw. In June our kids had swim lessons. I was so impressed with their instructor, she worked well at two completely different ability levels and they both made significant progress. We gave this to her on the last day. 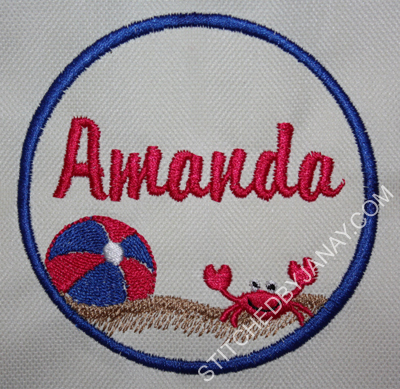 I used LP's Circle Beach frame (without fabric) and added "Amanda" with Embird alphabet #7.